Two options available to team up with a partner and compete at The Best of Both. 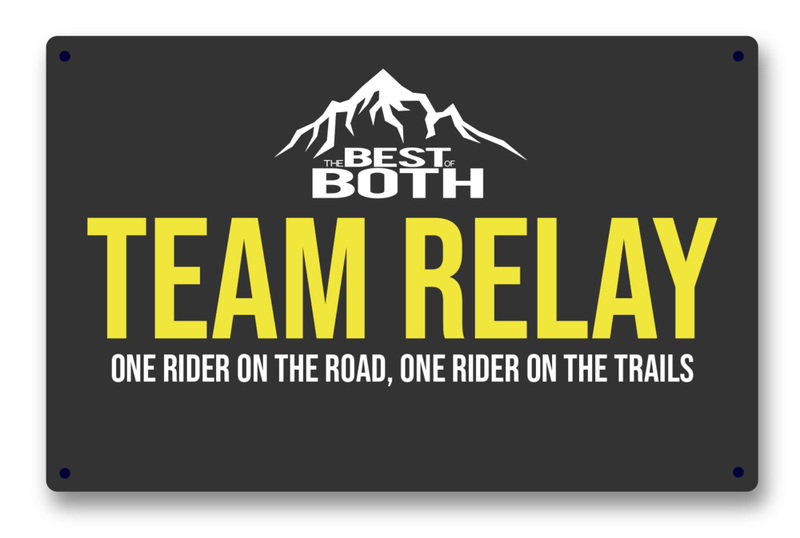 The Team Relay puts teams of 2 riders into the race, one on the road and one on the trails. The DOUBLES CATEGORY sends 2 riders out to work together over the entire course. The Team Relay is an option for everybody. For those who may feel the entire course is beyond them, why not split the workload and team up with a friend, family member, riding partner, or colleague. Or team up with a specialist and race for the purse in the lower age group category. 85 Miles - 62-miles on the road and 23-miles on single-track. 2 x Age groups - combined age 79 years or below + combined age 80 years and over. Compete FOR The 2019 “Best of Both "Dream Team Champions” JERSEY - one jersey for each team member. Equal cash purse - 1ST $500 ($250 per team member) IN THE 79 AND BELOW CATEGORY WITH PRIZES FROM 2ND TO FOURTH. Prizes from 1ST Place to 4TH Place IN THE COMBINED AGE 80+ CATEGORY. Teams of 2 riders, any age or gender, work together over the entire course - the ultimate teamwork scenario. Teams are encouraged to stay together, because the last rider in the team to cross the finish line, stops the timing chip. 85 Miles Including 62-miles on the road and 23-miles on single-track. Categories: COED - All ages. Prizes from 1ST to 4TH Place..